There’s no fixing these doors - they’re on the way to the junkyard! Doors end users are reaching out to SCHWEISS DOORS for help! ”Cost Saving” is never having to buy a door more than once!
. . . Cylinder Brackets broke off . . . door came down!
. . . 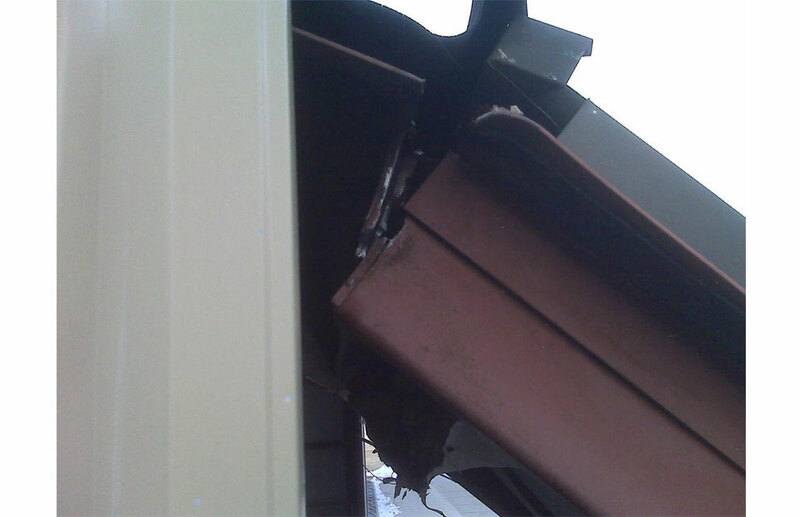 Important: inspect your hydraulic door!
. . . Company is not returning any phone calls!
. . . See the many photos below! Be On The Safe Side... Have Your Door Inspected! is no longer in Business . . . And Neither is the Door! The hydraulic cylinders brackets broke loose from the door columns. The cylinder brackets had torn off the side columns under the weight of the door. The cylinders and brackets were too light weight to do the job. DON'T LET A CALAMITY LIKE THIS HAPPEN TO YOU! Imagine waking up to this knowing that you won't be able to get your aircraft out of the hangar. 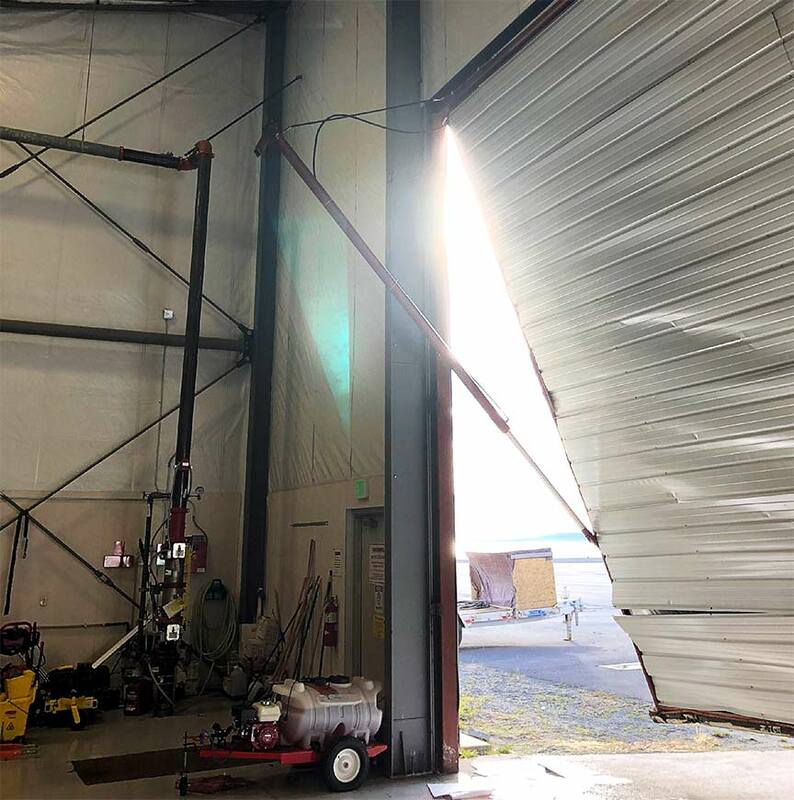 This inferior "other brand" hydraulic 74' x 19' Florida hangar door literally fell off its hinges and had to be sent to the junk heap. It was replaced with a Schweiss hydraulic door. 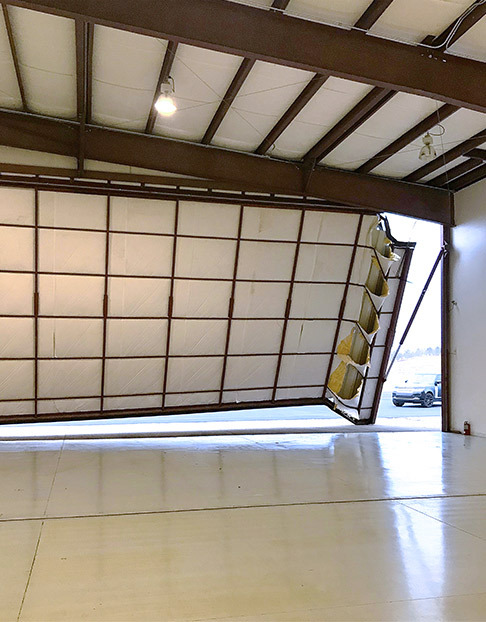 Imagine walking out to your hangar to take in an important business meeting or family vacation and your big 74’ door is twisted and lying on the ground. A Florida airport manager experienced this shocking revelation. This was a perfect case that emphasizes the need for hydraulic or bifold door buyers to do their homework on why some manufacturers doors and door components are superior to others. 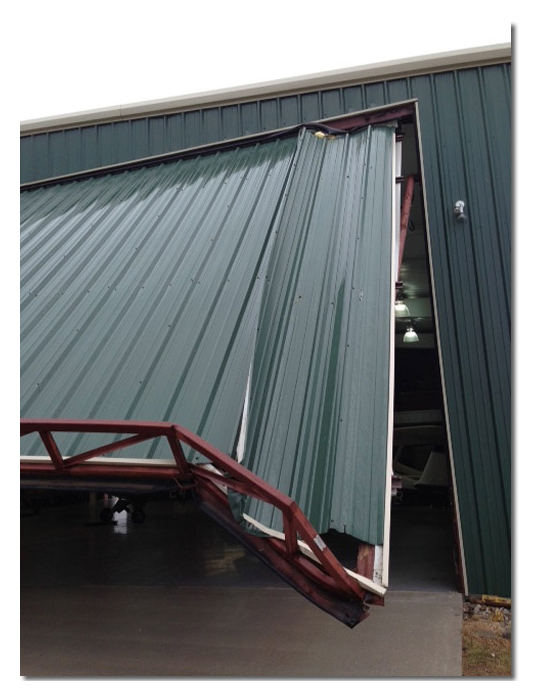 A “Brand X, company, now out of business” sold and installed a 74’ x 19’ hydraulic door at Airglades Municipal Airport in Florida that went to the ground due to inferior hinges not strong enough to hold the door in place; and this was during normal weather conditions, no wind, no storm whatsoever! The entire door had to be sent to the scrap heap and was replaced with a Schweiss hydraulic door. A perfect scenario of why “cheap” doesn't save you money in the long run. 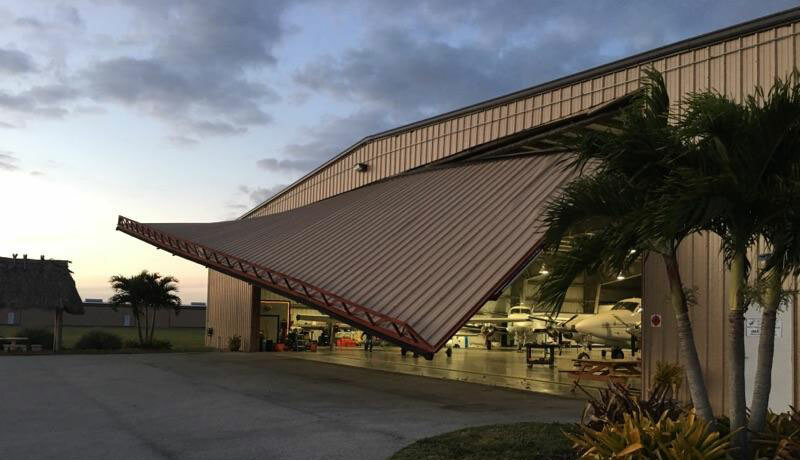 “I can tell you one thing, if we ever have to replace any other doors, it will be with a Schweiss door and not any other brand door; there is no doubt about it,” said Tom Vaughan, who manages the Airglades and LaBelle municipal airports near Clewiston and in LaBelle, Florida. Getting a new Schweiss hydraulic door fixed this dilemma, but can you imagine, there are 69 more of these inferior doors at LaBelle and Airglades to worry about each day. 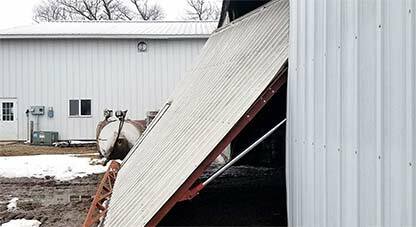 You might expect something like this to happen if a tornado, hurricane or high wind conditions ripped through the area, but exactly the opposite was the case - weather conditions were not a factor. 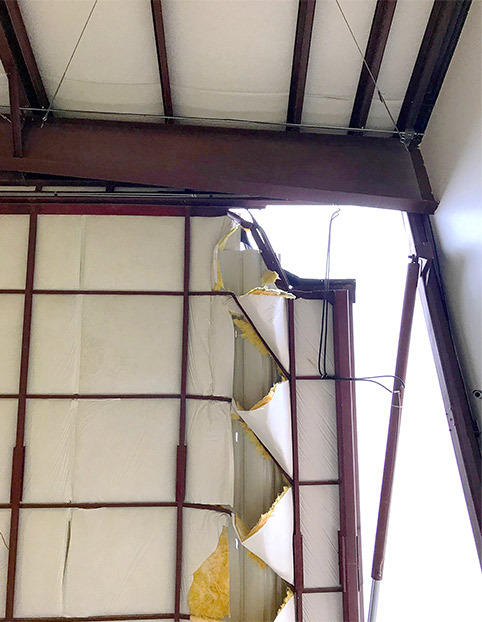 “It looked like the top hinges broke off starting with a structural failure at one corner which created a domino effect halfway across to the side of the building. There were several planes in the hangar at the time, but they thankfully weren't damaged. This calamity put the hangar out of operation for four months,” said Vaughan. Vaughan said that when his door fell he had heard prior to the incident that the door company had gone out of business. Looking online to see what other door designs there were, he ran across Schweiss Doors. They also had a local tenant, who upon returning from the SUN 'n FUN air show saw the Schweiss Doors display and described how well they were built. “We chopped up the door and threw it away. It wasn't good for anything else; it was just nothin' but a hunk of junk metal sitting there. It wasn't even an old door; less than six years old, it was installed in 2010. I think the company that built it is now out of business or operating under a different business name. I wasn't even able to call the manufacturer to see if he would stand by his product,” said Vaughan. 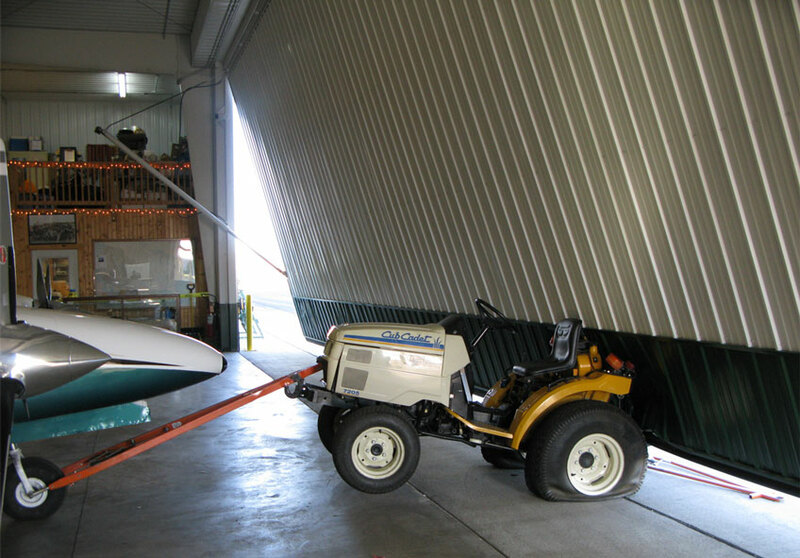 The hangar now has a 74’ 3” x 19’ 2” custom-made Schweiss hydraulic door on it. The door is engineered for 175 mph windload with a 12-volt backup system and reinforced with a strong external truss and Schweiss' hydraulic steel frame with triple push tubes. The newly designed wrap around hinges can be lubricated from inside the building. It also has a hydraulic 2-speed valve that enables the door to slow down at the top and bottom cycle for smoother operation. “Schweiss doors are overly built, the hinges are 10 times better and bigger than the chicken sh-- hinges on the other manufacturers door. They all have grease fittings where the “Brand X” doors don't have grease fittings. The Schweiss cylinders are about three times the size for the same size door. “We asked our local aviation engineer to look at the Schweiss door from his engineering standpoint. He took pictures and we gave him a brochure and he said he was going to take it back to his engineering firm to tell them if they have any future clients interested in putting up a door to direct them to Schweiss. Our Schweiss hydraulic door arrived on time and in good condition. Schweiss made a promise to have it to us in three weeks, and they darn sure did. We were thinking it would be 60 to 90 days to get the door. I worked with the engineers at Schweiss Doors and they were very helpful with suggestions and gave us all the information we needed,” concluded Vaughan. You know what they say about hindsight being 20/20? It doesn't have to be that way if you just do your homework before deciding on whose door to buy! 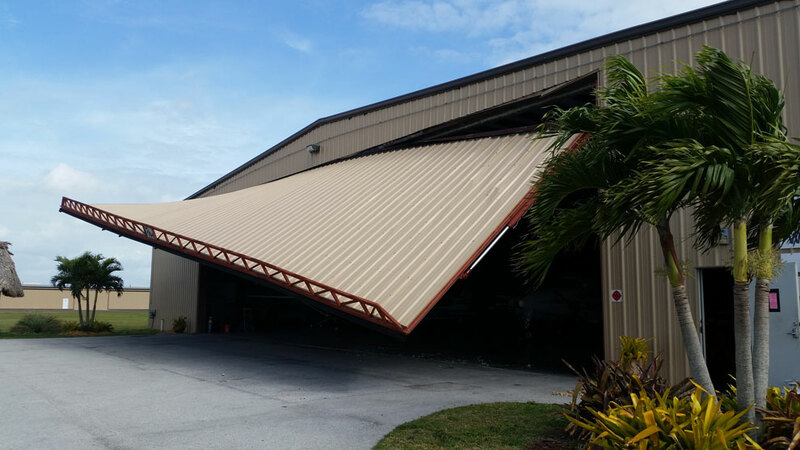 The large Florida hangar had several aircraft inside when the "Brand X" door collapsed. Had a plane been leaving the hangar it could have resulted in a lost aircraft or even death. Another door less than six years old being hauled off to the junkyard! In addition to the loss of many thousands of dollars worth of useless door, additional expense was incurred to remove it and purchase a Schweiss replacement door. 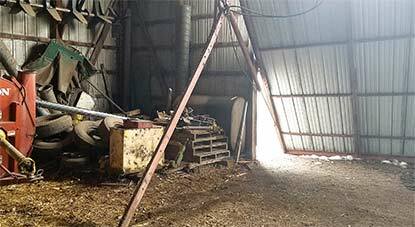 The less than six-year-old hangar was put out of commission for four months. • Cutting torch • Fire blanket • Jack to lift the doorframe • A welder and a good parts store! It seems that in the hydraulic door world, some keep using the same design, putting little or no thought into improving it. So guess what? You end up with the same-old design! Good or bad, time tells the story. See the door video below! When you buy a door it may come with all the hydraulic safety gismos, but when the frame tears apart and cylinder brackets rip off the subframe, the door is coming down fast! This is not safe! WHAT KIND OF FRAME DESIGN DO YOU HAVE? Your browser does not support this embedded video. Check it out on YouTube. Metal doorframe failed, not the hydraulics! No Safety protection when this happens! Do you have one of these doors? Be careful! Poor welds - poor design - poor customer! The tug did a wheelie after the cylinder brackets busted off the door frame. The large hydraulic door came crashing down... Not good! The tug operator got lucky that day. Close call! Damage to the green inside liner sheeting. "...I DON’T TRUST MY DOOR ANY LONGER"
Schweiss Doors knows there are potential door failures out there, even though door owners are unaware of issues that exist with certain hydraulic doors. 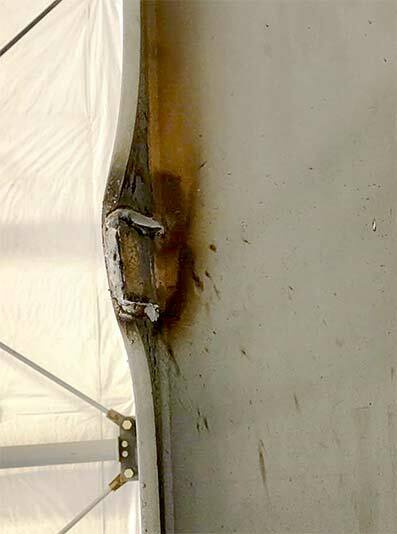 The company that manufactured your hydraulic door may have gone out of business, leaving a door owner with safety issues. This results in additional costs, lost time, and lost money finding someone to repair your door. "After seeing my door fail, I do not trust my door any longer!" Can you imagine opening your door day after day with planes, farm implements, boats, and people coming in and out and walking under an unsafe door? Experiences like this will revolutionize the way people see these types of hangar doors! Everybody tries to sell you a better mousetrap... But time tells the real story! The top cylinder brackets on both sides of the door failed at the same time. The door company is no longer in business... Who will fix it? Broken cylinder brackets tore off and door came crashing down! The bracket broke at the weld... Looks like a bad design... Maybe not strong enough? One size does NOT fit all doors! It appears others are using brackets, hinges, and cylinders designed to be "one-size-fits-all." But one size does NOT fit all doors! When manufacturers don’t understand that forces and eccentricity keep increasing as the doors get larger and larger you end up having a door that, over time, may fail when using underrated cylinders, cylinder brackets, hinges, and a doorframe that is too light. The cylinder bracket ripped off and the door came crashing down... Wow! The company who manufactured this door is no longer around! The bracket twisted/tore off the hydraulic door subframe. superior to the bifold door... Really? 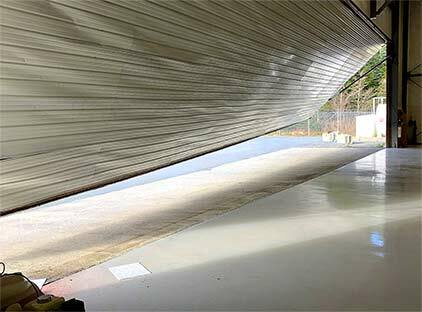 Schweiss Doors comes across these scenarios of door failures caused by others who don't understand how to manufacture a safe working hydraulic door. Maybe that is why they are no longer servicing these doors. When a door destroys itself beyond repair, it's time to buy another door from a reliable company. to service your door. It's gonna cost you! You thought you had the best. What do you think now? Do your homework and know who you are dealing with when buying your next door! You can see what happens when someone doesn't understand door safety! Someone could see that it wasn't strong enough... Hope this will fix it! It would be safer to take the door out of service and replace the entire door! The doorframe looks patched together. Aftermarket Patch Job! Will globbing additional metal to the cylinder brackets void the warranty? No, there is none! The company is no longer in business or servicing broken doors. brackets rip apart! More mods done to this door! Was the metal too light? The door is ripping apart! The end hinges pulled off the door frame. Poor manufacturing or poor design... or both? Do you think this is a poor design or bad weld? Either way, its not good! The top of the doorframe by the hinges is strarting to destroy itself - pulling apart. More failure near the top door frame. The door that was supposed to be superior to the bifold door... What do you think? No Swing left in this door... It was hauled off to the junk yard. It's costly to remove and replace an existing door that is destroying itself! What you order from some door companies isn't always what you expect or deserve to get. 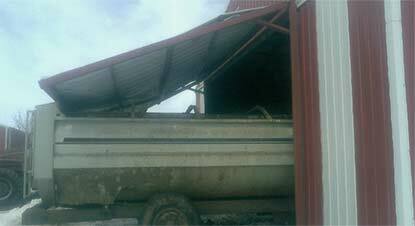 Take, for instance, a hydraulic door owner who experienced not one, but two major door failures. It didn't take long for him to realize he was in a situation where he not only had a door that didn't function, but now people's safety and his expensive equipment was at stake with his faulty door. This door company didn't deliver on its promises. It's easy to boast, brag, and bash all other door brands out in the market place, but first, and most importantly, you need to fully understand the engineering that's needed for each door size. You will probably end up with failures if you think one size widget will work on any size door. You may end up owning an unsafe product, to say the least, and are stuck with a door that will cost you double. You'll be forced to purchase a replacement door because your original door completely destroyed itself due to old-fashioned engineering. That "old-fashioned" engineering may have been "no engineering at all!" Nice literature sells! You need to realize what keeps a business going is a dependable company that manufactures a better and safer product. Splice connection on the hydraulic door frame. DON'T BE PULLED IN BY THOSE FANCY ADS - "IT'S ALL ABOUT SAFETY!" 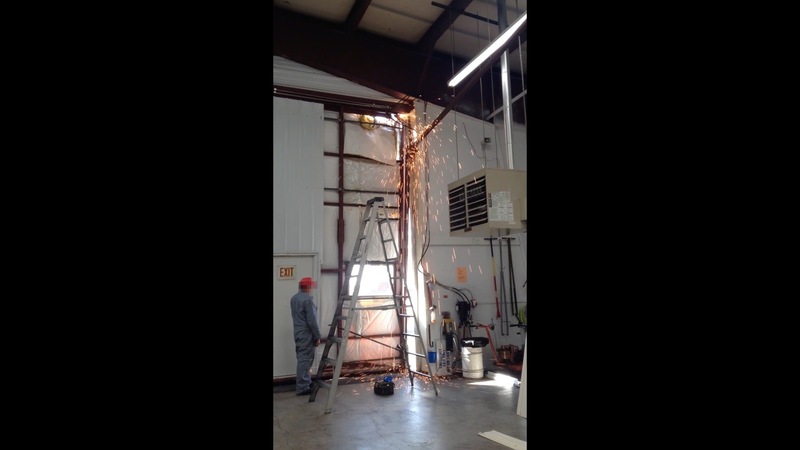 Safety should be a top priority for any hydraulic door. With all the hype you encounter and slick marketing that goes into the door market, you can be mislead to believe the door you are considering is the best door on the market. It could be, but in order to get the best door on the market you must select a reputable door manufacturer. Someone who has many years of building expertise and who supports the hydraulic door industry with a "Trusted Brand Name" and a product to back it up! Gussets added to the verticle uprights... After thought? Who pays for the huge cost of a replacement door? Ouch! Is your hydraulic door in need of structural repair and your door company is no longer in business? Did the door company leave you on your own with no support or warranty on your broken door? A company no longer in business cannot be contacted for comment on common problems. 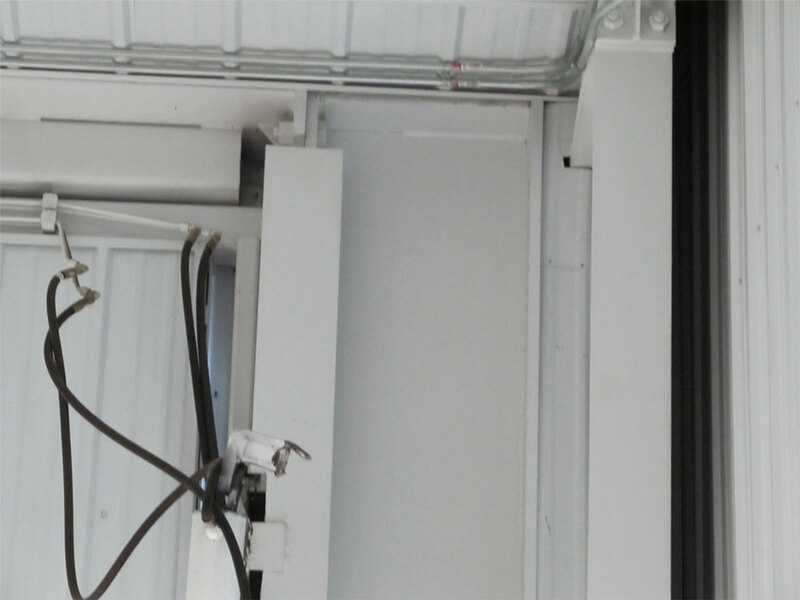 The scope of this report is to evaluate the forces on the existing hydraulics while opening the door and provide recommendations regarding the door opening force and commonly reported problems and failures. Door side tube becomes detached from door top tube. First exterior door hinge becomes detached from building door subheader. Door top cylinder bracket becomes detached from door subjamb. 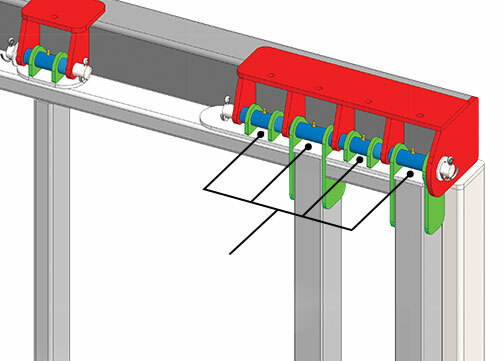 The hydraulic cylinder connection to the door subjamb should be reinforced to resist the full Hx and Hy cylinder forces. While an actual analysis of the existing cylinder bracket is beyond the scope of this report, the attached photos and sketches do not appear to be capable of resisting this load. 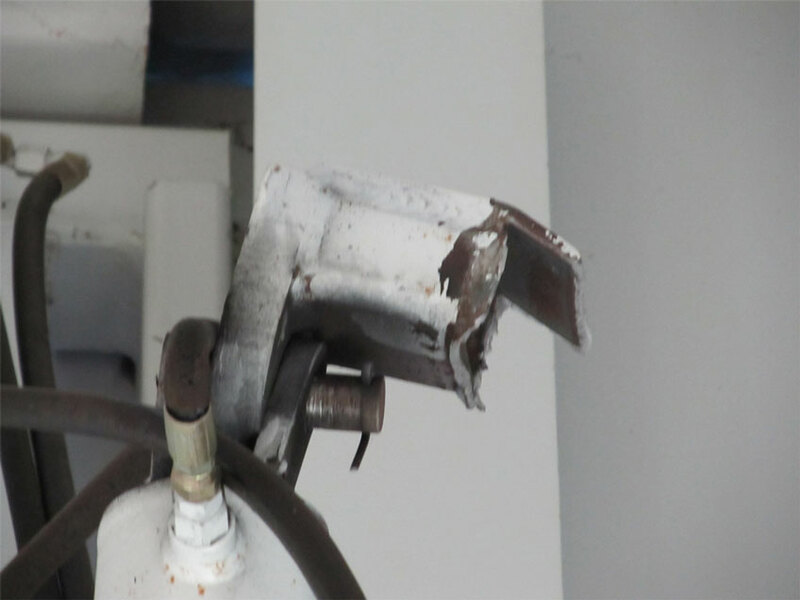 Anecdotal reports of movement or twisting of the existing bracket and cracks in the existing bracket welds would indicate that, in the opinion of the author of this report, the brackets require reinforcement. Analysis of the existing hinge is outside of the scope of this report. 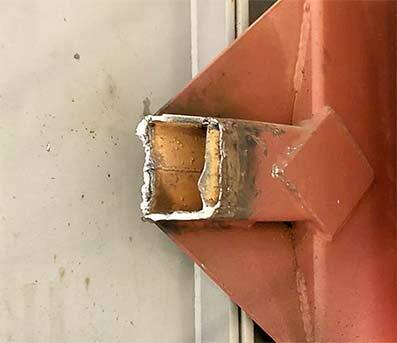 The first exterior hinge should be replaced to resist the full exterior hinge reaction force of 29.0 kips horizontal and 3.8 kips vertical. Analysis of the existing connection is outside of the scope of this report. The gusset must be sized to transfer the 29.0 kip force parallel to the door-side vertical member. This force must be evenly distributed to the first exterior hinge connection. The existing structure should be evaluated by a qualified professional engineer to determine if the door-side column is sized properly for torsion, bending, and axial forces as indicated in this report. 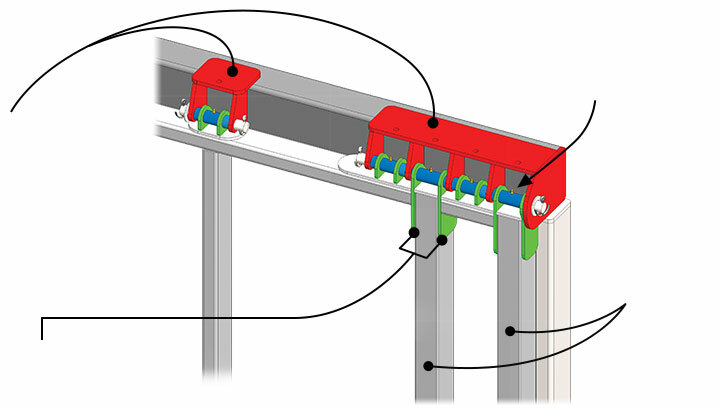 Evaluate the existing load transfer from the first exterior hinge to the lateral force resisting system of the building. Hydraulic cylinders should be evaluated to determine if they are sized appropriately and have proper spherical bearings to reduce excessive wear and reduce bending stresses. What can happen when others fail to report loads or the proper loads? 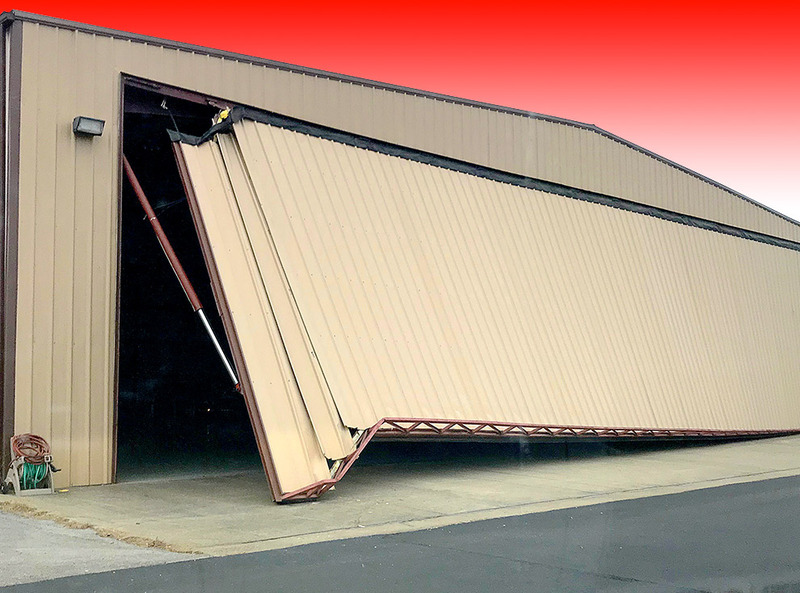 When manufacturing large moving doors, without understanding how increasing door forces put additional strain on the building, others have failed to report loads properly. Maybe they don't know how to obtain the correct information. In that case, they're not giving building manufacturers the important detailed information they need. There's windload strength built into each hydraulic door. You're taking a big risk if the other hydraulic door manufacturer designed the door and reports the loads of the door for the closed position only! Now the building company doesn't have good information to properly design the building structure! That's risky business! 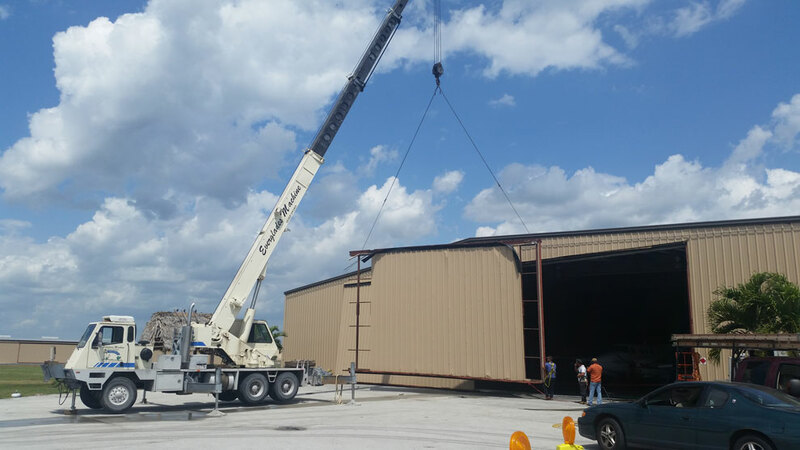 The end result... the building manufacturer doesn't build the building to be strong enough or capable of handling all the increased forces that a large moving door will have on the building structure, which can lead to more failure! It appears others are using brackets, hinges, and cylinders designed to be "one-size-fits-all." But one size does NOT fit all doors! When manufacturers don't understand that forces and eccentricity keep increasing as the doors get larger and larger, you end up having a door that, over time, may fail when using underrated cylinders, cylinder brackets, hinges, and a doorframe that is too light. Yes, it's true that hydraulic doors have been a big part of the large commercial door market for years now. BUT, over time, hydraulic doors continue to increase in size. Hydraulic doors keep getting larger and the door forces increase as the doors increase in size. As hydraulic-style doors get larger, the forces become much greater, but they're still lifted at only two lift points, putting more stress on those two cylinders, top cylinder brackets, hinges, and the doorframe. It's an exciting time for Schweiss Doors. We are continually engineering and delivering the next generation of Hydraulic Doors to a market that is long overdue! Schweiss Doors leaves its customers with a much safer product and better support that's backed with years of "Safe Door Sense." That's why Schweiss Doors is the leader in the hydraulic door industry. We're not trying to see how cheap we can build it - Schweiss is driven to build the Best Door! Names are easy to come by, manufactures are not!
. . . Know who you are dealing with!!! Same Brand X . . . Same Failure! If the Company went out of Business! Included is a detailed list of hydraulic door problems of others that are no longer in business! Circle the line items that best explain what you experiencing and submit to the Schweiss Doors factory. We'll do our best to address your door issues! we can repair or upgrade doors that are out of warranty. Hydraulic doors purchased from OTHERS may have a defect in the top pivot point mount for the hydraulic pistons, where the top pivot mount has broken loose. When this happens, the hydraulic piston breaks away from the structural subframe of the door. If this happens the door is going to come down real fast. As you can imagine, somebody or something is going to get hurt. Designing the building's door side column for torsion on the door column due to the eccentricity of the door cylinder and it's bracket and the door subframe is important. A simple check for a potential problem is to jog the door as it opens or closes. If you notice ANY twisting or movement where the piston cylinder attaches to the top of the door's subframe, immediately TAKE THE DOOR OUT OF SERVICE and fix the problem. It's clear that OTHERS are learning about engineering hydraulic doors the HARD WAY!!! "Additional workspace by providing a canopy to work under." This is an accident waiting to happen! Hope their poor manufacturing practices have not given the hydraulic doors a bad reputation, but most importantly we hope that no one has been injured and nothing has been destroyed under their doors! • Door left open in windy conditions. . . . Will your door cylinders carry all the forces the wind and the door have on them? • Door left open in windy conditions. . . . Will the buidling structure support all the forces the door and wind have on it? Starting the New Year With A Door Failure!!! Both of the 70 ft door cylinders broke and fell off, the door came crashing down, smashing the tug, damaging the door sheeting, scaring the crap out of the tug operator (the plane was safe though). Schweiss received an emergency call for help since the original manufacturer is no longer in business. How many other doors will come crashing down? It's important to know who you're dealing with when purchasing large hydraulic doors... It's a good thing no one was injured. What do you think it will cost to fix it, the down time, the fear of it failing again, who made this door? Know who you're dealing with! What seems like a good door deal can turn into a nightmare! Will you door be the next to fail or fall? Be Careful!!! It's important to have the proper size cylinders on each door! You must KNOW THE FACTS and KNOW THE LOADS on the door that will be repeatedly impacting every member of the door, its subframe, and your valuable building structure. These things fatigue like anyhting else, and if improperly designed, their life span can be extremely short; that leads to DANGER, DAMAGE, and FAILURE. WHAT DOES IT REALLY MEAN TO THE END USER OF THE DOOR? If the door company I rely on for warranty claims goes out of business.Now What? If a company you depend on for your commercial door need disappears, you could be left with a lot of unanswered questions. What does this mean for my door? Who do I turn to now for repairs? 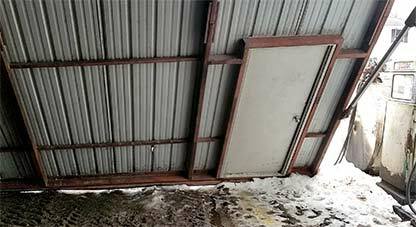 My door is a very important part of my shop or hangar - will this unexpected situation hurt my real estate values? You might be thinking: What good is a door if the brand name is now tarnished? 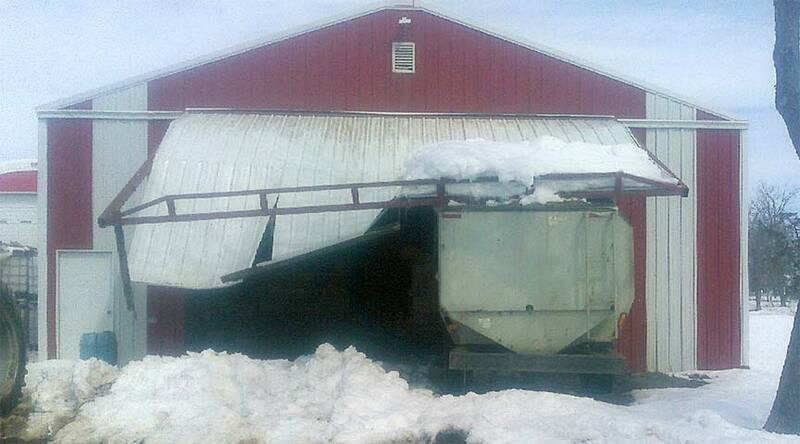 When your bifold and/or hydraulic door provider goes under, you're the one who gets sold short. You're left with no service, no replacement parts and no one to walk you through important service issues. Think about it: what if something really goes wrong? A working bifold or hydraulic door is an absolute must for a properly functioning commercial building; you must trust your door! Do Your Homework... look into a door Company's reputation... longevity... and experience! Really! When you're looking to purchase a hydraulic or bifold door, you should always look into a door company's reputation, longevity and experience. Without a good reputation and a solid history, what are you left with? Not a thing - and definitely no one to rely on! It's scary when you have no backup for such a large, important component of your building! Price is one thing and quality is important, of course - but no warranty? Now there's an awful thought! 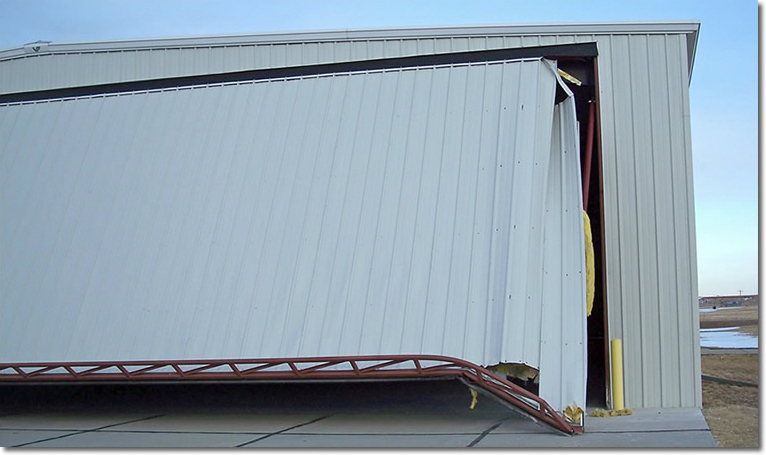 Imagine getting ready to fly and your hangar door just won't budge! You and your plane aren't going anywhere. 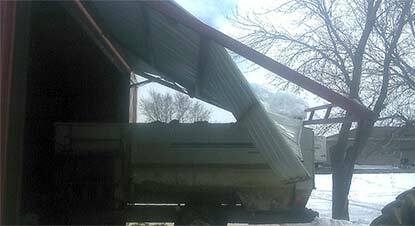 Getting ready to move your farm equipment and your shop door just won't budge! 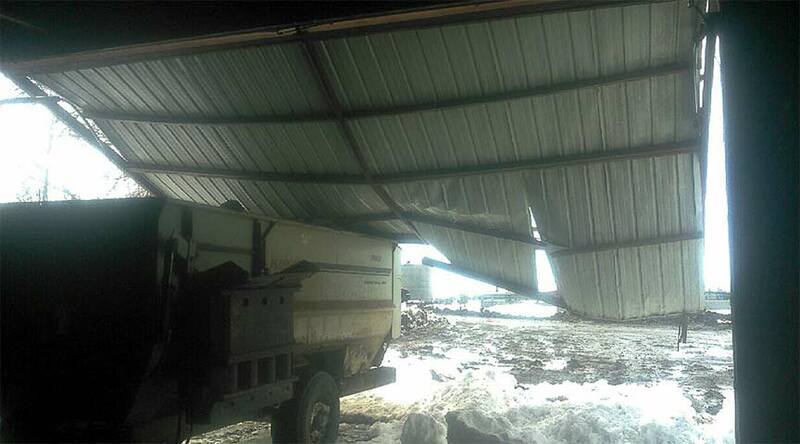 You and your large farm equipment aren't going anywhere. You run to the phone for helpful customer service, only to find that the door company you rely on is no longer in business! Looking for the Cheapest? When you're tempted by the cheapest option on the market think about it first - because you really do get what you pay for! Without available service, you're really in a tough spot. Those problems will keep multiplying. Without that warranty, you're left calling around to find a reputable repairman. It's highly likely that repair company will ask you for the name of the door manufacturer - and once they find out the door company is no longer in business, they might just run from the mess, leaving you back at square one! In today's lawsuit-abundant world, a decent repair company isn't going to run out and assume the liability when the slightest thing goes wrong! In the real world, when that original door manufacturer is nowhere to be found, the last person to touch that door could be liable for negligence - and any good repair center knows this! Here's the thing: you're not only buying the door, you're buying the odds that the company will stick around for the long haul, ready to service your moving door when you need it most! At Schweiss Doors, we are in it for the long haul. We've been around for more than 35 years and we're not going anywhere! We're available to service the heck out of your door and we'll always be here when you need us. Just remember this: Sure, that door you rely on so much moves great today - but just knowing that, should something ever go wrong, Schweiss Doors will back you up - now that's real peace of mind! You shouldn't have to experience that lonely, scary feeling when your door company goes out of business - at Schweiss, we're always here for your commercial door warranty needs. ALWAYS! Sometimes the topic of warranty seems trivial, but at Schweiss Doors, we know there's much more to a door sale than just the sale itself! When you purchase a hydraulic or bifold door from Schweiss, you're just beginning a lasting realtionship with our company. We provide ongoing service - and that's the Schweiss Advantage! Warranty is everything! Imagine calling a company only to find out nobody's home - the entire company was dissolved! "Sorry baby, you're on your own!" No one wants to hear those words! At Schweiss, we know warranty is huge! Warranty is everything! A warranty without the original company behind it means absolutely nothing. Warranty is worth it, it's everything, and you need a door company that will carry you through any service issue that may come up! At Schweiss Doors, we're here to help! We have a proven track record of excellent warranty servicing and fantastic customer care. Red Power Hydraulics Schweiss does it Better! 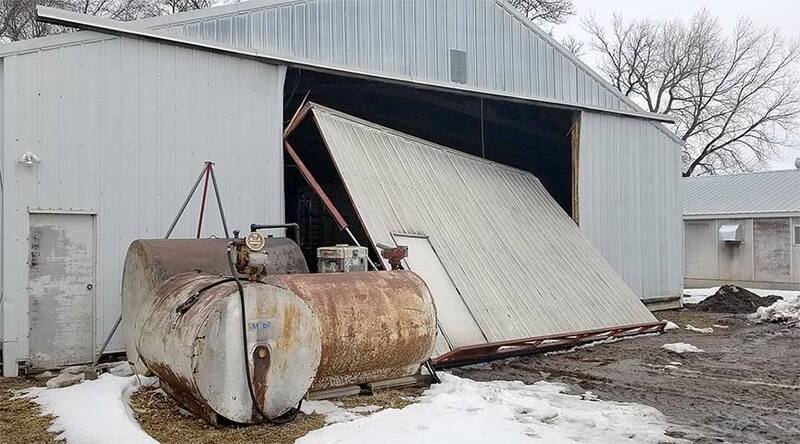 Quote... A farmer asked..."When the door is hanging straight out there, you better have something strong holding those cylinders, doesn't that put a lot of stress on the building?" Quote... A engineer once said... "The Doors Will Find the Weak Points in our building design. 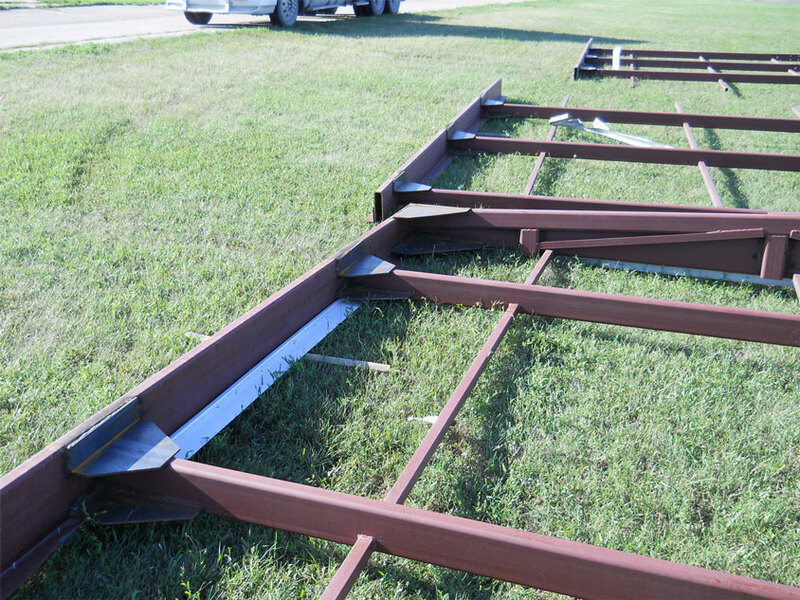 M any metal building engineers have a tendency to get lax with the design of the door supports and framing surrounding your doors and forget that we not only have to support the weight and wind on the door, we also have to support its operation." *NOTE: "It's better to overbuild your building than to make costly repairs later." 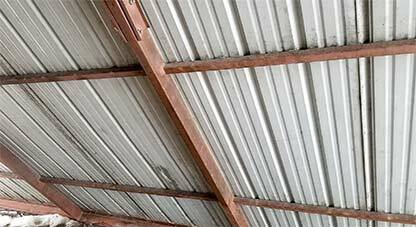 • Door can be left open in windy conditions, can the building withstand the forces? USE COMMON SENSE and the Schweiss Door Specifications and Reactions sheet to find out the rest of the story! Schweiss Doors is the leader in the development of hydraulic doors, building on their experience from Bifold Doors. Schweiss has spent extensive time analyzing and developing "New Specifications and Reactions" of hydraulic doors that provide the forces that are transferred to the building framing. It is critical that the customer pass these "Specifications and Reactions" onto the Building Designer. No matter what you may see on other door supplier's websites, literature, specifications or reaction sheets there are some things that you can be sure of for any hydraulic door. Hydraulic door forces are considerably different from bifold doors. Bifold doors roll up the face of the door side column, hydraulic doors cantilever from a fixed location on the cylinder bracket which is offset inside and behind the door side column. Bifold doors fold as they open. Hydraulic doors open as one piece so the hydraulic door is cantilevered much further than the bifold door. 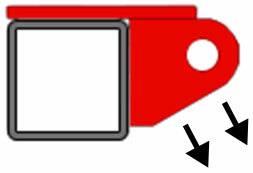 The operator of the bifold door distributes much of the dead load of opening the door to the hinges. 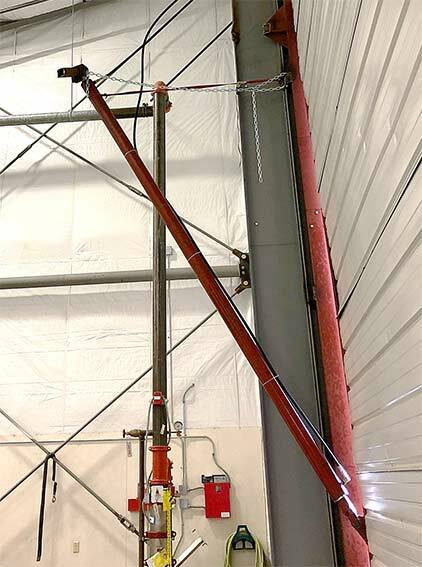 The hydraulic doors are opened using powerful hydraulic cylinders which concentrate the door opening loads at the cylinder bracket location on the building door side columns.